I took the trouble to create my own flag (see below) as the Freezywater flag was smaller than I wanted. I ended up using an 18 mm version. I knew there was a reason I get my flags printed in four sizes. For my own reference, and because pictures of Roundway figures are scarce, the figures in the above are, from the left, RKG2, RKE3 (I think), RKF1, RKE3 (I think). I mixed the horses up a touch; RKG2 is riding the horse from RKF2 and vica versa. I'm not sure about the trumpeter because he came loose with over a dozen assorted medieval packs I got from Ian Hinds of Hinds Figures Ltd. I bought a job lot, sight unseen and when it arrived I had a great time sorting out what I'd got. Risky but fun. 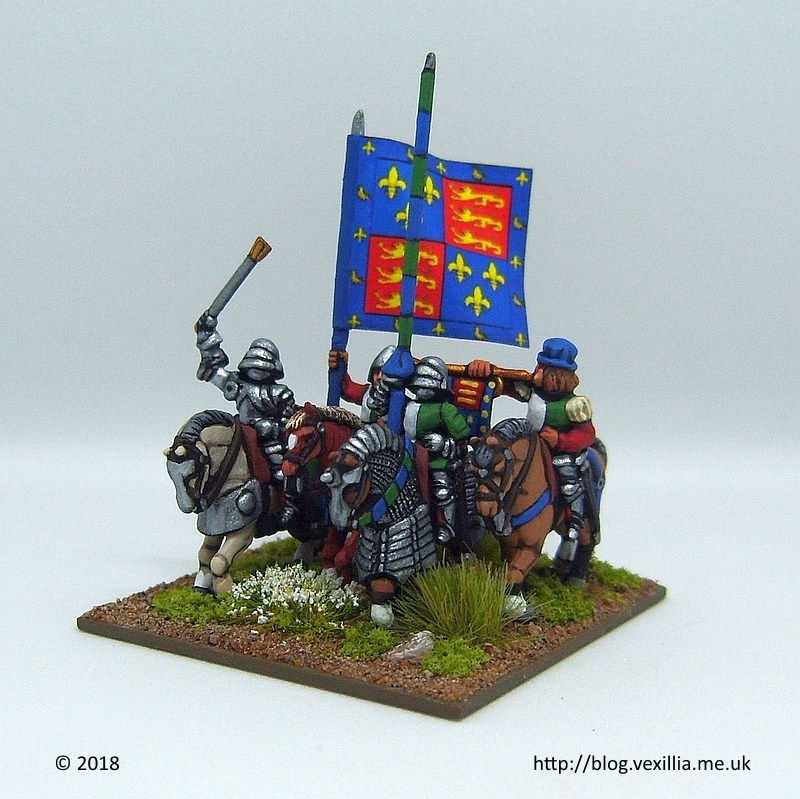 Anyway here's few extra photographs mainly to show the hand painted heraldry on the trumpet banner. However, before I started painting I had to recreate the bulb at the end of the trumpet with Milliput as it was miscast. I was amazed how easy it was. 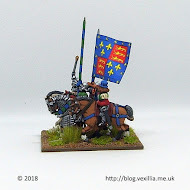 Flushed with this success I decided not to paint the trumpet banner in simple livery colours but went the whole hog and attempted Henry's arms! The cloth is so small I substituted lines for lions and spots for fleur-de-lis & martlets. The end result is far better than I'd hoped. 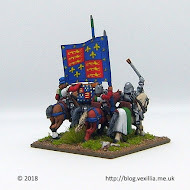 I have enough figures to do command elements for the Earl of Oxford and Rhys ap Thomas but I don't have any more trumpeters so I think they will feature just three figures based together. I suppose that's only fitting as Henry was the key man. 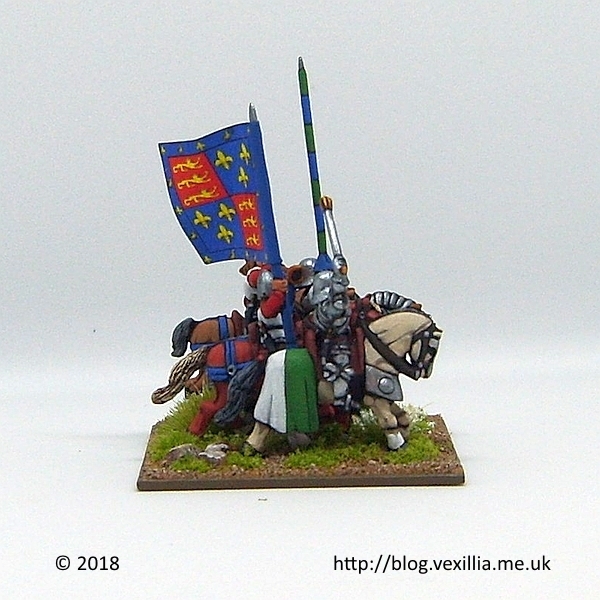 For my tips on how to print & mount flags see my earlier post on Livery Flags. Those look really good - clean with very well-judged colours. 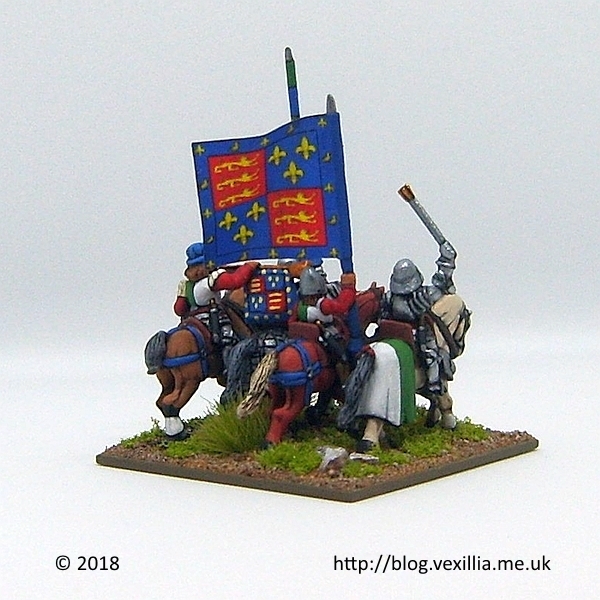 The trumpet banner in particular looks great - I like the idea of echoing the banner but simplifying to make it paintable. 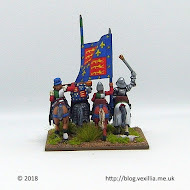 I've got some Roundway late medieval figures too: Crossbowmen that I modified as Italian Wars aventuriers but also some knights waiting in the lead pile - maybe I should move them up in the queue having seen what you have achieved. Thank you for your kind words. Fine praise from someone who paints so well themselves. 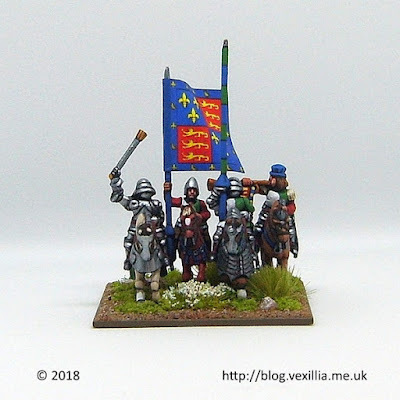 I hope they inspire you to do more 15 mm Italian Wars as I really enjoyed your 2015-16 series of posts. Any man who replaces crossbows in 15 mm deserves a lot of followers. Post script: after refreshing my knowledge of livery colours and how they are applied I decided that the split rear horse bard probably had the colours the wrong way round. They should have been green/white, if split on each side, to match the livery flag. There's no direct evidence for split barding either way but I feel it would be more consistent as green/white with the white portion nearest the rider. 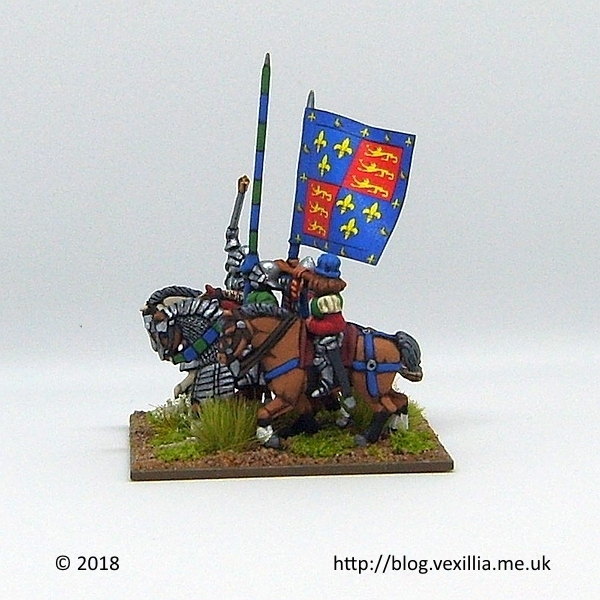 I have now repainted the barding. It was hard on a based figure and I had to do away with the split barding as I couldn't reach all of it. The right side of the barding is now all white and the left all green. At least this is consistent with how livery jackets were coloured. Update: replaced Henry Tudor's flag with the one used in the photos. Original had narrower three lions.